Out of posterity (and because I haven't seen myself at the top of a table for a while), I thought I would update my old lifetime predictors' table to the end of last season. For those who haven't been around since the beginning, I've also done a Points Per Prediction version, which is topped by the mythical Stantos, who obviously decided after eight games that there were better uses for his extraordinary powers of prescience. Should be interesting to see how this has changed at the end of the season. I look forward to seeing you peasants squabble for second place, because there is only one Trophy4Toon Prediction League King. 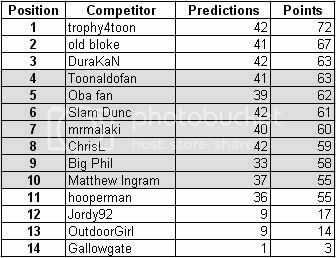 The Newcastle United Prediction League 2008/09 / The Trophy4Toon 2008/09 Prediction League Summary! The Hall of Champions is a bit empty at the moment, but that does not detract from its prestige. If you're wondering why it's occupied solely by trophy4toon admin staff, it's because you're not bribing me enough. I was scrabbling around desperately trying to think of a way to reward myself, when I came across this idea - essentially, just a list of how everyone has performed over their whole predicting career. 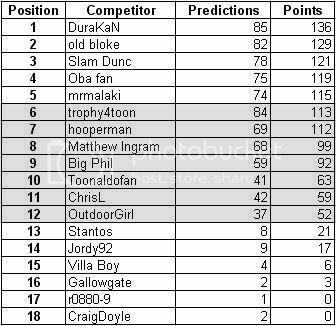 As you can see, it is quite close at the top between myself and old bloke, while Slam Dunc is a surprise in 3rd place. Trophy4toon is only 6th, thanks to his dismal season last year. If anyone else would like to dish out their own awards, feel free. You will notice there is no Moron of the Year award this time, because I simply couldn't think of any obvious candidates, so I will leave that to the rest of you to allocate, should you wish. But enough about Hull - we have to do our bit first. Aston Villa are a side whose season seems to have ended some weeks ago, but they're still a good side, and they might want to give their fans something to cheer in their final home game of the season. Let's just hope they stop playing after eighty minutes, as they often do. I'm afraid I'm going to predict a grim 1-0 defeat. Saturday is the day of our penultimate game of the season and our final home game, as Fulham travel to St James's Park. Will Newcastle become complacent after the big win over Middlesbrough, or will they take to the field buoyed by a fresh wave of confidence? I don't really care anymore, but I'll predict 1-1 just for the hell of it, setting up a nervy last game of the season away to Aston Villa. Next Monday, we face Middlesbrough at home in a game of earth-shattering proportions, and there is indeed the possibility that defeat here might just destroy one of these clubs. Certainly, if either side is to avoid relegation this season, this is a game they will have to win. I have no clue. We can't score and we can't defend, but neither can Middlesbrough. Maybe another anti-climactic 0-0. Next week we play what will probably be a pointless game against title-chasing Liverpool. Since there has been a surprising number of 4-0 scorelines, I'm changing my prediction to 5-0. Portsmouth are the visitors next Monday night, as once again we take to the field with the added pressure of playing last, which means we will inevitably be even further from salvation. Portsmouth look like they're staying up, and that could work to our advantage if they take their foot off the gas, but Newcastle know that they have to win, and that will make the task all the more difficult. I think this match hinges on our resolve. If it's good and we come out fighting, we can win this match, but if it continues to crumble, as it has been recently (besides the last 30 minutes against Stoke), we are doomed. My short supply of optimism has run out, and I'm going to predict a 1-1 draw. We face another away game next Sunday, though Tottenham may prove to be a less formidable destination than Stoke. With our opponents having moved up to 8th in the table, it's clear that we have more at stake, though whether that's an advantage or a disadvantage is debatable. I've got no idea at the moment, so I'm just going to put down a 2-1 win for us, and maybe change it later when my head is more grounded in reality. With Chelsea out of the way, Shearer's test really begins as we enter a crucial period in the history of our football club. 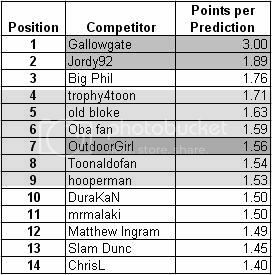 More importantly, there are just 7 games left to win the Prediction League title! I'm going to predict a 2-1 win to Newcastle. I'm trying to justify it, but I can't. We host our second top 4 team in as many matches when Chelsea make the long trip from London in 2 weeks' time. Chelsea's brief revival under Guus Hiddink was halted at Tottenham on Saturday, and our 0-0 draw earlier in the season may inspire some confidence in our team, but it's difficult to think of a team at any level that don't have a chance against our defence at the moment. Personally, I'm not convinced of Chelsea's potency, and with 2 weeks to drill the defence and get some injured players back, I think we might just be able to restrict this match to a 1-0 defeat. I'm going to predict 3-0 to Arsenal. We travel to Hull for our next game, and it's not looking great. Hull finally managed to end their winless streak against Fulham, and we've played them three times already this season with no success (lost 2-1 at home, drew 0-0 away in the FA Cup, lost 1-0 at home in the replay). On the positive side, an encouraging performance against Manchester United should give the team some confidence, and there's nothing to say that Hull will definitely turn things around from now on... We might also have some players back by the time this fixture rolls around, and those who have recently returned will have a chance to sharpen up. We host Manchester United in this midweek fixture... This will be their 4th game in 12 days, but that won't stop me from predicting a 3-0 away win. Apparently we're going to try and play an attacking game, which is a good thing in my opinion, but I am still changing my prediction to 4-0. Because of the break for internationals, and the fact that February is a short month, the monthly champion will be announced after this game, so make your predictions count! Call me mad, but I'm going 2-1 Newcastle. I will give this a sense check closer to the match. And here's the sense check. 2-0 to Everton.